Nearly three months after protests began in New York and later expanded to cities around the country, 44% support the Occupy Wall Street movement and 35% oppose it. Americans are much more likely to agree with the concerns raised by the movement than to approve of its tactics. By 48% to 30%, more Americans agree than disagree with the concerns the protests have highlighted. However, by a nearly identical margin (49% to 29%), more disapprove of the way the Occupy Wall Street protests are being conducted. Even those who say they agree with the concerns raised by the movement are somewhat divided over its tactics: 50% approve, while 40% disapprove. The public is overwhelmingly critical of the fairness of the economic system. Most (77%) agree that there is too much power in the hands of a few rich people and corporations. And while a majority of Americans (58%) still say that “most people who want to get ahead can make it if they are willing to work hard,” this is lower than at any point since the question was first asked in 1994. Nevertheless, most Americans continue to reject the idea that the United States is a country divided between the “haves” and the “have-nots.” Just 38% say they think of America this way. And there is little change in public optimism about the country’s ability to solve its problems; 60% say the country can. Views of the Occupy movement split along party lines. About six-in-ten Democrats (62%) agree with the concerns it has raised, compared with 50% of independents and 31% of Republicans. And while Democrats are divided about the way the protests are being conducted (43% approve, 37% disapprove), few independents (29%) or Republicans (14%) approve of the methods. Republicans overall oppose the movement by nearly three-to-one (59% oppose, 21% support). Yet while conservative Republicans oppose Occupy Wall Street by a wide margin (68% to 14%), moderate and liberal Republicans are more evenly divided (43% oppose, 38% support). Nearly three-quarters of liberal Democrats (72%) support Occupy Wall Street, compared with more modest support (55%) among conservative and moderate Democrats. Younger Americans back the Occupy Wall Street protests more than others: A plurality of those younger than 50 supports the movement (47% support, 30% oppose), 50-to-64 year-olds are more divided (45% support, 38% oppose), and opposition is highest among those 65 and older (33% support, 47% oppose). The Occupy movement, which has been focused on income and wealth divisions in the country, garners more support than opposition from Americans with annual family incomes of less than $75,000, while those earning more are about equally likely to support as oppose it (45% vs. 43%). But within that income group there are substantial internal divisions on this question: A majority of those with incomes of $150,000 or more (55%) oppose it, compared with fewer (40%) of those with incomes between $75,000 and $149,999. Notably, among Democrats and Democratic leaning independents, those with incomes of $75,000 or more are substantially more supportive more of Occupy Wall Street than those with incomes of less than $30,000 (71% vs. 56%). Among Republicans and Republican leaning independents the pattern is reversed: Those with incomes of $75,000 and higher oppose the movement by nearly five-to-one (72% oppose, 15% support), views among Republicans with incomes of less than $30,000 are more divided (41% oppose, 30% support). The public also views Wall Street negatively, little changed from opinions in March. Currently, just 36% say Wall Street helps the American economy more than it hurts—51% say it hurts more than helps. Majorities of both Democrats (60%) and independents (54%) say Wall Street hurts more than helps, while nearly half of Republicans say Wall Street helps the economy (49%). Americans with annual family incomes of $75,000 or more are less critical of Wall Street than others. Half (50%) of higher income people say Wall Street does more good than harm, compared with just 31% of those with lower incomes. 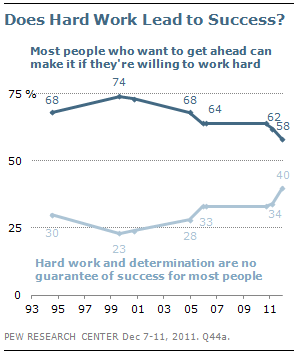 On the whole, Americans continue to say hard work leads to success; 58% agree with the statement that “most people who want to get ahead can make it if they are willing to work hard,” but this is substantially lower than the proportion expressing this view in previous surveys. Today, 40% agree that “Hard work and determination are no guarantee of success for most people,” which is up six points since March. Democrats are now evenly divided over whether hard work leads to success: 47% say most people who work hard can get ahead, while 50% say hard work is no guarantee of success for most people. In March, 56% said hard work leads to people getting ahead while 40% said it is no guarantee of success. Independents also are more likely to express skepticism about the value of hard work than they were nine months ago (36% then, 42% now). 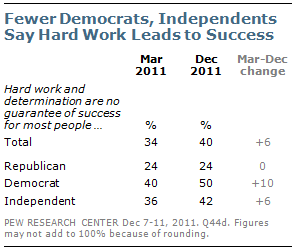 Nonetheless, a majority of independents (56%) agree that most people can get ahead through hard work. Republican views on this question are virtually unchanged over this period. Currently, 75% say most people who want to get ahead can make it if they are willing to work hard; just 24% say hard work is no guarantee of success for most people. Even as they express frustration with the fairness of economic system, most of the public rejects the notion that the nation is divided into two groups: the “haves” and the “have-nots.” Nearly six-in-ten (58%) say they do not think of America in these terms, while just 38% say they do. Although opinions on this question have varied over the course of its more than 25-year history, for most of this period majorities have rejected characterizing the country in this way. And, as is the case today, if forced to choose between the options, pluralities have consistently identified themselves as “haves,” rather than “have-nots” (46% vs. 39% today). 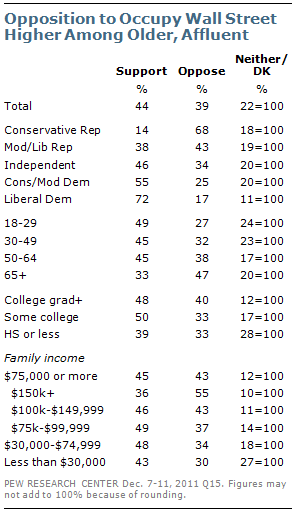 Most Republicans (72%) and independents (60%) say they do not think of America in these terms. Democrats are more divided; 52% say the country is divided along these lines, while 46% say it is not.